Some of the best views of Southern California have been witnessed after heavy storms and this weekend was one of those special opportunities. We had heavy rains on Friday and Saturday, bringing spectacular weather on Sunday and Monday. I had missed out on hiking on Sunday, but luckily Monday was President’s Day and I made sure I was on a trail for the holiday. For my hike up to Echo Mountain, I packed heavy camera gear in anticipation of a stunning sunset… and Mother Nature didn’t let me down. For more on this video, plus photos of the sunset, please visit my other site, The Hike Guy. I’ve been glued to the television watching the rescue of the miners in Chile. Thirty-three men have captured the world’s attention after they became trapped a mile underground following a mine collapse. I’m not alone in watching this drama play out, with a rescue capsule being lowered into the earth, then loaded with a miner, and slowly reeled up, back to the surface to the cheers and tears of those watching around the world. As I write this, the third miner is being brought to the surface, his wife waiting in the wings, her face showing the emotions we all feel. The tribulations each of these brave men must have gone through, having survived the collapse of the mine, living like troglodytes for almost 70 days underground, and separated from their friends and family by a mile of dirt. It is hard to imagine what they have felt, not only during this historic event, but as a miner in what is being reported as an unsafe mine. I’m looking forward to hearing their stories, as I’m certain we will, and the path each took in their lives that lead to this fate. As I watch this dramatic event unfold on the television, I’m reminded of my own chance meeting with a Chilean miner. 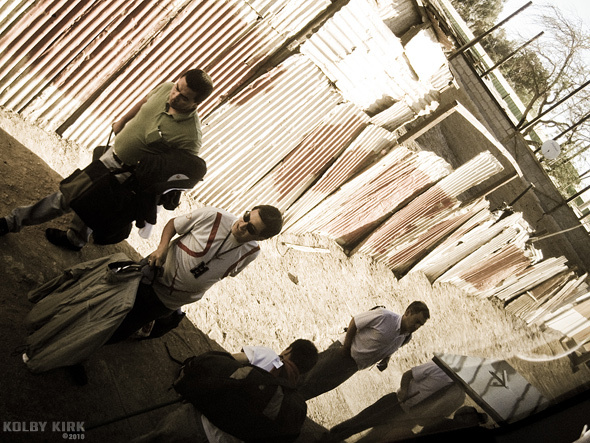 In late 2009, I spent a few weeks backpacking through Chile and Bolivia. For one section of my journey, I traveled 1,471 miles by bus, from Pucon north up to San Pedro de Atacama. On this bus, I met Claudio. Before traveling to Chile, I signed up for a Google Alert on anything regarding the country. For weeks, I received a daily summary of the news stories coming out of Chile. The global economy was tanking and Chile was being hit hard in many industries. However, copper was soaring in price, and since Chile is one of the world’s largest producers of copper with at least one-third world share followed by the USA, Indonesia, and Peru, mining was hot. Chile produces over 1,200 pounds of copper every year and despite the doubling of prices of copper, wages for miners weren’t moving and this lead to strikes across the country. 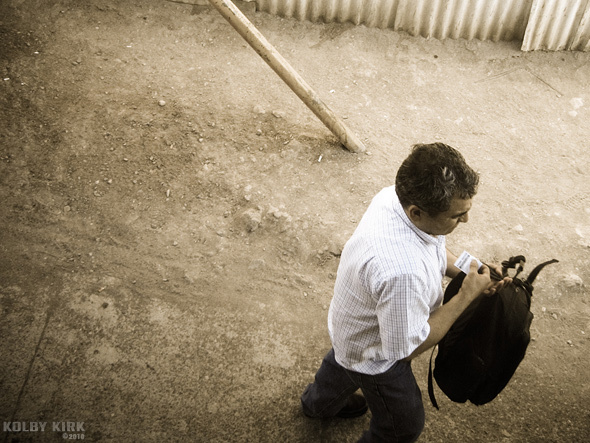 We pulled into the dusty town of Calama, a town that is completely dependent upon the men who work in the surrounding mines. I said good-bye to Claudio and watched him retrieve his small suitcase from the belly of the bus, as did other miners who journeyed from Santiago. Two lives from completely different backgrounds came together for just a moment in time. While watching the parturition of the thirty-three miners from their underground womb, I think of Claudio and the indelible impression he left on me. 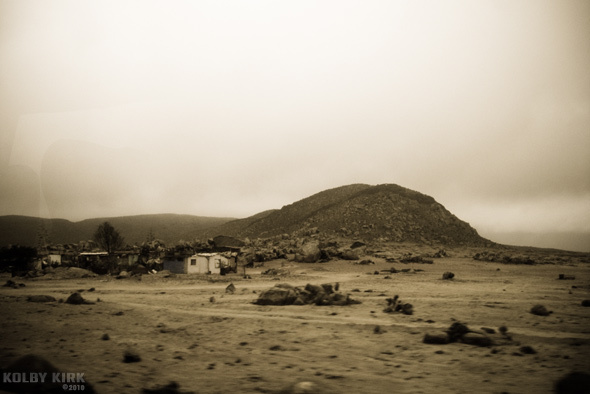 I got a brief glimpse into what it is like to be a miner in Chile. I hope he is safe, wherever he is. Isle del Sol, Bolivia - photographed on my previous trip to the area, in 2004. In just ten days, I will be departing for South America to spend three weeks exploring the wonders of Chilé and Bolivia. I’m excited to see for the first time northern Chile and re-visit Bolivia, especially the Lake Titicaca area (above). I know it has been a while since I’ve blogged on this site (mostly because I’ve been blogging over at 100hikes.com instead), but I hope to update here from time to time in the next month. If I don’t have a moment to take a break from the trip to blog, I’ll definitely post a few write up’s after my return in December. You can also follow me on Twitter (user: kahunna), where I imagine I’ll be sending more frequent updates than here. I also have an album of butterflies I was lucky enough to photograph. You can find those photos at my other site, bugshutterbug.com. 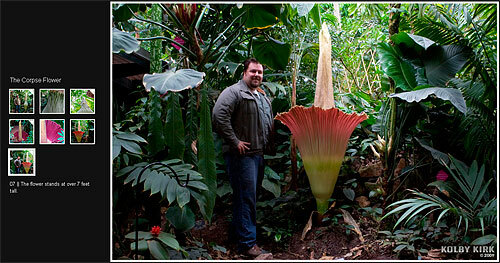 Amorphophallus titanum, or The Corpse Flower, is the largest flower in the world. It is also very rare and blooms from this flower is even more of a rarity. I was considerably lucky to be in the right place at the right time. I was given full access to the flower before the media, members, or guests of the Huntington Botanical Gardens were allowed in. The bloom lasted from 2pm on June 17 and wilted in the late afternoon on June 18th. I was there at the peak of its bloom! By the way, you might have noticed a lack of posts here. I’m still busy taking photos, nonetheless! 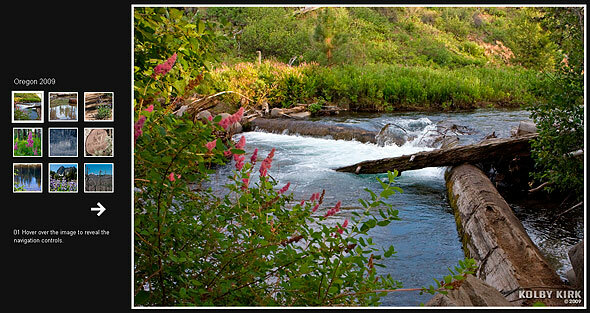 Come over and check out my other blogs, 100hikes.com and bugshutterbug.com! 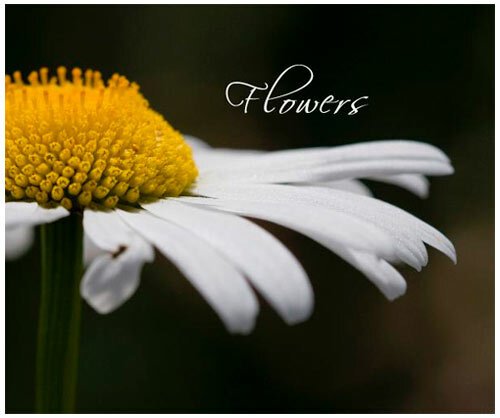 Just in time for Mother’s Day, a book of flowers! Part 2 – Where are the insects?? If you missed part one of this two-part report, click here. 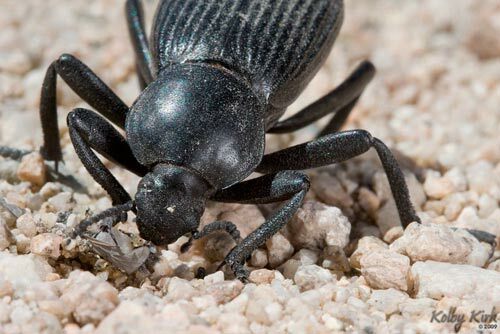 Those of you with fine-tuned observational skills might have noticed that the first part of this Mojave National Preserve trip report failed to mention any bugs. The fact is that I went most of Saturday without looking for insects to photograph. My goal was to explore on Saturday and concentrate on finding and photogging bugs on Sunday. I wouldn’t be disappointed! I should admit now that the first photographed insect occurred around dusk on Saturday. 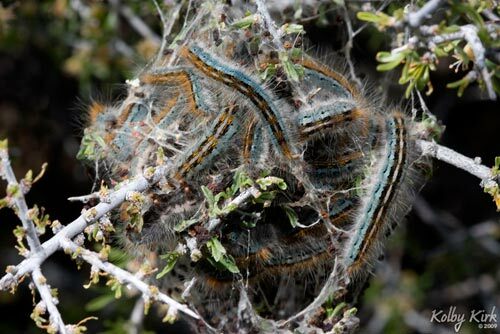 While hiking around Shadow Valley in search for a campsite, I discovered the unmistakable silk tent of the Western tent caterpillar (Malacosoma californicum) on a creosote bush. A few caterpillars were out of the nest for me to photograph. This wouldn’t be the last time I’d see these colorful, social moth larvae today. After a cold night of camping where temperatures dropped below 30°F (-1°C), I packed up and headed south on Cima Road. It was another beautiful day in the desert. 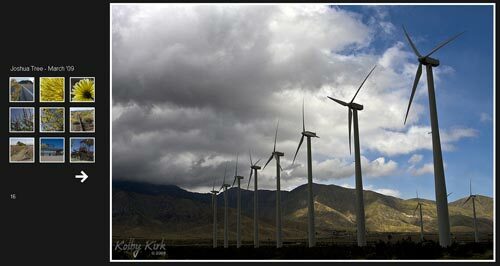 It was a little breezy – gusts up to 20mph – but wouldn’t last beyond 8-9am. My goal for the day was to check out the Hole-in-the-Wall campsite and info center, but I was in no hurry. My first stop of the day was at the ghost town of Cima. It consisted of a half-dozen or so buildings and a dozen rusted vehicles. It also had a simple building still in use as a market and post office (closed on Sunday). I stopped and explored the remains of a small home. The ground around the building was covered in pieces of wood and metal from the home. Of the scraps of metal strewn across the desert, I could identify a metal mattress frame, screen door, and a heating duct- all possibly over 50 years old. I spent an hour turning over the remnants of the dilapidated material looking for insects. In that time I would find two centipedes, a nest of harvester ants (Pogonomyrmex), a beautiful desert spider and a small beetle with a blue sheen. I don’t know how, but I also spotted a tiny spider the size of a mite, no more than 1 mm in body length. 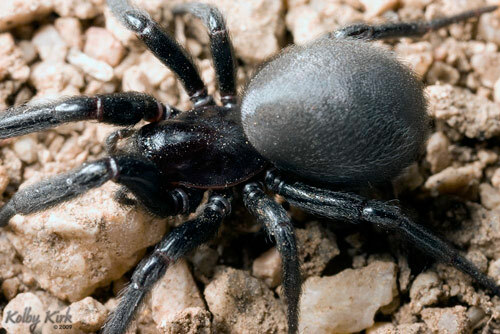 The large gray/black spider (Plectreuridae Plectreurys) measured about 13-15mm. It crawled in jerky movements based on vibrations or movement around it, which reminded me of how lizards move. The dark side of this wooden plank was obviously its lair for I found three dead beetles sucked dry in her trash. The centipedes were not happy to have been disturbed. It has been years since I’ve captured a centipede, so I was a little intimidated by their speed and reflexes. 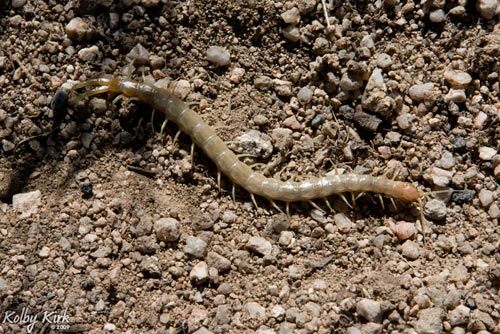 I recently read up on the centipede and learned that they have unique “legs” called gnathosomes or gnathopods which are pincer-like appendages used to inject venom into their prey. They spend most of their time during the day under logs, stones, or in this case, a sheet of metal in order to keep from dehydrating. At night they hunt for anything they can catch and, based on how fast they move, that’s probably quite a bit. They eat mostly insects, but have been known to capture and eat lizards and small rodents as well. I’m having trouble identifying these centipedes, so if you can help, please leave a comment. The small beetle I found measured about 7mm. It has a nice bluish-green tint to it in the light. It was very difficult to photograph, even in the small container I used to temporarily house it while I snapped away. I could have spent all day in Cima looking for insects, but I was drawn by a desire to see more of the park. 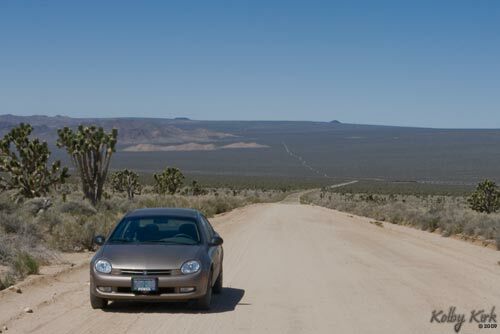 I headed west on Kelso Cima Road for five miles until I came to Mojave Road. This unpaved road has more history behind it than the nearby Route 66. 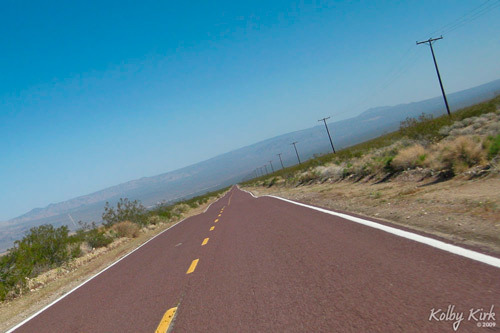 In fact, Mojave Road was the Route 66 of its time before the Chicago-Santa Monica highway was built. This 138-mile trail is not much different today as it was when American pioneers traveled across it in their wagons in search of a new life and prosperity the decades following the Civil War. But even this layer of history can be peeled back. At one time, this was once used by Jedidiah Smith, John Fremont and other American pioneers. Before that, the Mojave Indians in the early 1800’s used this trail. 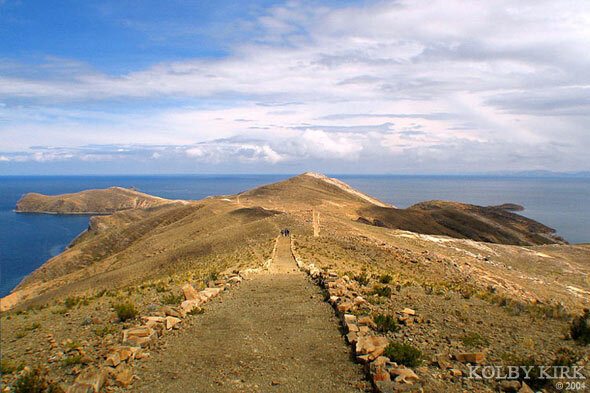 And even before that, it is said that Spanish Franciscan Francisco Garces might have used this very trail around the time our forefathers were signing the Declaration of Independence. The road is well groomed, thanks to local support, but with all dirt roads in the desert, it has become corrugated, making it a slow drive for my non-4WD vehicle. Going at speeds of about 15mph (24kph) allowed me to check out the scenery and keep an eye on the road for any crossing creatures. This is how I found my next insect. It wasn’t hard to spot this large darkling beetle crossing the road. 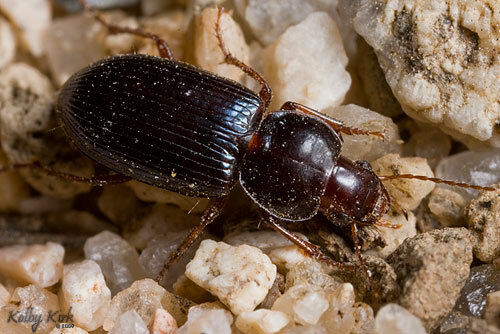 The black Eleodes measures about 4 cm from maxilla to pygidium. I found it just as it discovered its next meal, allowing me plenty of time to get out my gear to photograph it. I’ve seen Eleodes many times in the Mojave Desert, but this was the first that had striae along the elytra rather than a smooth abdomen. I believe this is an Eleodes obscura. I drove 11 miles of dirt roads before arriving at Mid Hills Campground, one of the two “official” campgrounds in the Mohave National Preserve (“Moja”). The place was empty and it was immediately clear why. A 2005 wildfire had destroyed much of the woods in this area. Even today it still looks like the aftermath of a nuclear war, with blackened dead trees and dark brown earth. Life is slowly returning to the area, but I wouldn’t want to camp here given all of the other options. Besides, I don’t know who would pay $12 for a campsite when you can camp off the side of the road for free. I continued south on Black Canyon Road which is still unpaved at this point. I assume most visitors on this road come up from the south, where the pavement ends immediately north of the Hole-in-the-Wall Campgrounds and Info Center. I wasn’t ready to check out the center quite yet. Just north of Hole-in-the-Wall, I took a mile detour down a dirt road. It was there I would spend the rest of my time in the park photographing a single creosote bush. For some reason, this bush had more life than anything I could see in the surrounding area. If you’ve kept up with my blog, you’ll know that my favorite insect to photograph at the moment is the syrphid fly, more commonly called the hover fly. So you could only imagine how excited I was to find this single creosote bush covered in them! 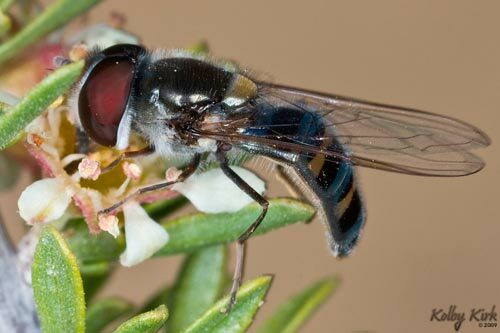 Along with 4-5 different syrphids attracted to the flowering bush were drone flies (Eristalis tenax), cactus flies (Copestylum Mexicana), flesh flies (Sarcophagidea), green bottle flies (Phaenicia sericata), and even spotted what looked like a fruit fly (Tephritidae) with their distinctly marked wings. Along with the flies were a few kinds of bees, most I’ve never seen before outside the covers of a field guide. Along with honey bees – by far the most represented at the bush of any insect – were 2-3 types of other bees. I spotted a few small mining bees (Andrenidae) and something that looked a lot like a leafcutter bee (Megachile sp.). Here’s my favorite syrphid photo of the day. I’m not having any luck identifying it, so if you can help, please feel free to post a comment. Winged insects weren’t the only visitors to this creosote bush. 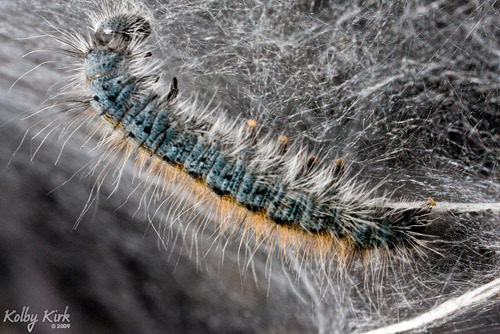 One or two families of Western tent caterpillars (Malacosoma californicum) could be found climbing on the bush, looking for food. It was getting close to 3pm and I wanted to stay in front of the weekend Vegas visitors, so I reluctantly left the creosote and headed home. Before I left the park, I stopped in briefly at the Hole-in-the-Wall Info Center, where I gathered pamphlets to read in order to plan my next trip out to the Mojave National Preserve. I have a feeling the trip will be sooner than later! Also coming soon will be more photos – lots of photos! – taken on this trip. Stay tuned! There’s a good chance that if you’re a Southern California driver and old enough to gamble (or maybe not), you’ve driven to Las Vegas. Every Saturday, thousands of drivers jump in their cars and eventually drive on Interstate 15 towards Sin City. As they say, what happens in Vegas, stays in Vegas, but eventually they all drive home with more or less money. I too have been to Vegas on this notoriously congested freeway. On the way out there, I’m usually thinking about how much fun I’m going to have and where I’m going to have it. On the return trip, I’m usually thinking about how I spent too much or drank too much or did too much of too much. Rarely am I concentrating on the scenery. Keeping my New Year’s resolution to visit the Mojave every weekend in the month of April, I decided to spend the first weekend of the month in Moja. I started my weekend at 4:00 am in the morning, hoping to stay in front of the inevitable Vegas traffic. With a couple of stops for fuel and food, it took me about three hours of traffic-free driving to get to the southern entrance of the preserve at Kelbaker Road. Researching and planning your trip to Moja is highly recommended. The park is so large, it’s important to have a good idea on what you want to see. With 2,500 sq. miles (6,475 sq. km) of land, I knew I wouldn’t be able to see it all in one trip. I would eventually cover over 200 miles of roads in and around the park during the weekend. Above: General route of my weekend trip. The first stop on my trip was the Kelso Dunes. Kelso Dunes is one of the largest dune fields in the western US, but that fact was lost to me when standing in the desert. 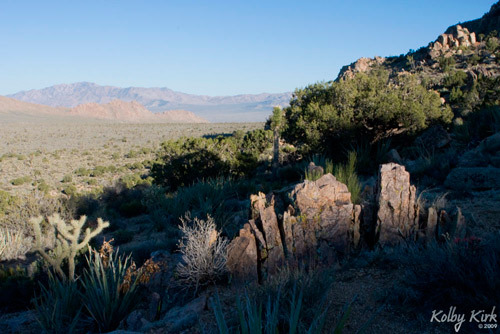 The Mojave Desert is so vast, it is difficult to get a sense of the size of natural features – like mountains, valleys, or sand dunes – since there isn’t any man made objects to compare them to. If it wasn’t for the placard near the dunes’ trail head, I wouldn’t have even fathomed that the sand laid out in front of me covered more than 45 square miles. Nor would have I known that the tallest dune stood 600 feet – 60 stories – above the desert floor! On my hike, I kept hearing what sounded like a low flying propeller plane. It wasn’t until later that I learned that the deep hum was the sound of the sand moving on the dunes, a completely natural occurrence found at only a few dunes in the world. After a hike on the dunes, I continued north to Kelso Depot, the center of Moja. 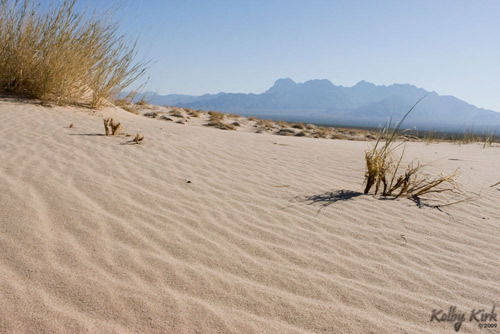 Kelso used to be a bustling desert oasis during World War II, when iron from Kaiser Steel’s nearby Vulcan Mine was shipped out of the desert by train here to be used in steel manufacturing for the war. When the war ended and rail traffic was reduced, the town dried up. Now, the highlight of the town is a single building: the Kelso Depot. 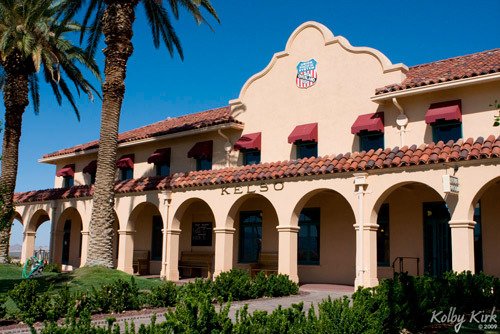 Built in 1924, the Kelso Depot is a beautifully kept train station surrounded by dark green grass and healthy palms: quite a shock to the earthy palette of the surrounding desert. Over the years, the building has served as a train station, restaurant, reading room, ticket and telegraph office, and housing for railroad employees. Visitors today will find it beautifully renovated, inside and out. The NPS Visitors Center includes a museum exhibit, a bookstore, and a few rooms furnished just as they were in the early years of the depot. They also have a 40-seat theater where you can watch a 12-minute movie on the park. I know I scoffed at those who watched a similar video playing at the Antelope Valley California Poppy Reserve, but with a park this big, I needed some visual assistance on what to see. Unlike the ancient video playing at the poppy reserve, this movie was fairly new and had a high production value. Plus, if it wasn’t for the movie, I would have never of known about the lava tubes of Moja! 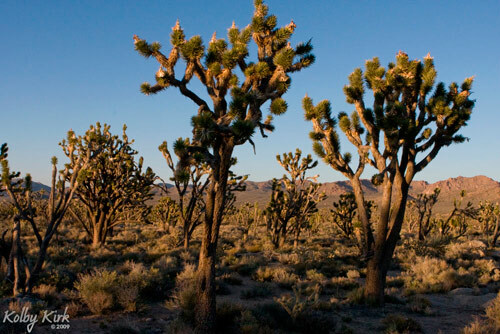 A few million years ago, the Mojave Desert looked a lot different. Angry volcanoes spewed rock and lava. Large lakes were full of life and surrounded by vegetation. If you squint your eyes, you can still see this ancient landscape, especially in the area known as the Cinder Cone Lava Beds. About 15 miles (24 km) northwest of Kelso Depot, you’ll find over a dozen ancient cinder cones jutting out of the landscape. The blackened lava can be over 45 feet thick in some areas. A short hike into this area and you might think you’re in Tolkien’s Mordor. My quest was less noble than Sam and Frodo’s: find the lava tubes I learned about in the visitor’s center. Even though I had three different maps and a GPS unit, I still spent over 20 minutes trying to find the unnamed, unpaved road that would lead to the lava tubes. Eventually I would find it and slowly navigate the rocky, uneven road with my Dodge Neon. I highly suggest to take a 4-wheel drive vehicle to Moja, not necessarily because roads are impossible otherwise (they could be after storms), but because it will allow you to see more of the park in a shorter amount of time. It took me more than 30 minutes to make it up the 6-mile road in my car. Once at a small parking area, it’s an easy 300-yard hike up to the entrance of the lava tubes. Entering the tubes have been made easier in recent years thanks to the installation of a sturdy metal ladder with hand rails. After climbing down the 15-foot ladder, I carefully navigated the lose rocks until I reached the floor of the cave. From here, I had to shuffle 30 feet through the narrowest point of the cave, measuring about three feet tall and 10 feet wide. Although I brought my camera, camera bag, and tripod, I had forgotten the most important item: a flashlight. Nonetheless, I was able to make it through after a brief rest as my eyes adjusted to the dark. 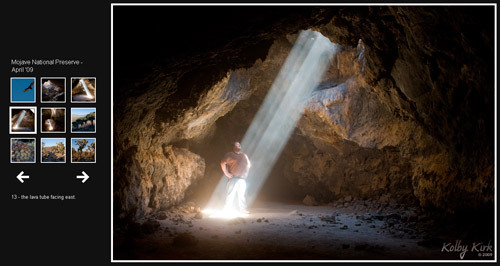 After crawling through the opening, I would emerge into a place I consider the most magical place in the Mojave Desert. The main portion of the lava tube opened up into a room about 60 feet long by 40 feet wide. 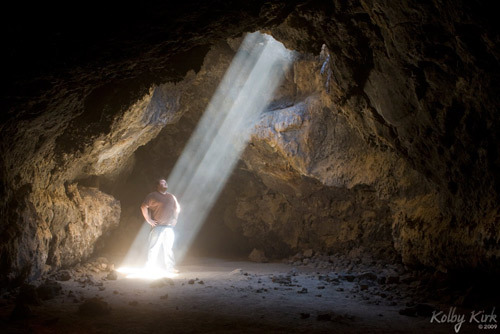 At certain times of the day, a glorious, brilliant beam of sunlight will shine into the cavern. I was lucky enough to have over a half hour of solitude in the room before other visitors would arrive. I left the lava tubes and drove back onto Kelbaker Road, continuing north. It was now around 2pm and I was hungry, so I drove 19 miles (30 km) to Baker, California for lunch. 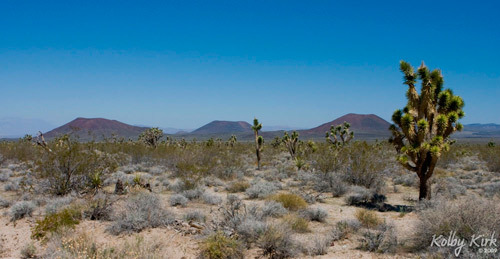 After lunch, I headed 26 miles (42 km) east on the I-15 to re-enter the Mojave National Preserve on Cima Road. The last major stop of the day would be a three-mile hike on the Teutonia Peak Trail, one of only seven maintained trails in the park. The first half mile of the trail appears to be an old road with two well-pronounced tracks. After a mile through open flatlands of Joshua trees, the path narrows and heads up towards the summit ridge. I was hoping to find an expansive view looking westward for the sunset, but the ridge only reveals a field of boulders among granite and monzonite outcroppings. I sat on the ridge and watched the setting sun change the colors of the desert from greens and browns to shades of orange. Since this park is a preserve managed by the Bureau of Land Management (BLM) and not a “National Park” per say, camping is allowed just about everywhere. The National Parks Service suggests finding a spot that has been previously camped in. 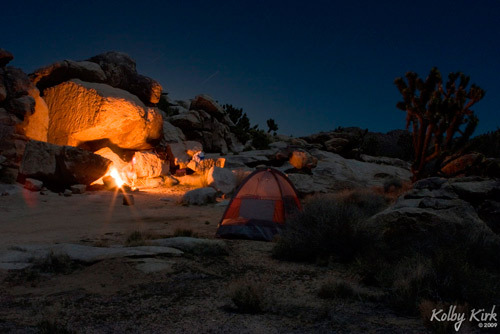 I didn’t look too far before finding the perfect campsite, complete with a boulder granite outcropping and a fire pit.